Fall is coming! You know what that means for those of us who live where the seasons change, and the trees lose their leaves? Yeah. Raking. Yard work. Planting bulbs for next year and winterizing your house are probably on your lists too. You’re going to get aches and pains. Thanks to Salonpas®, you don’t have to reach for those pills all the time. You can get safer pain relief with Salonpas. 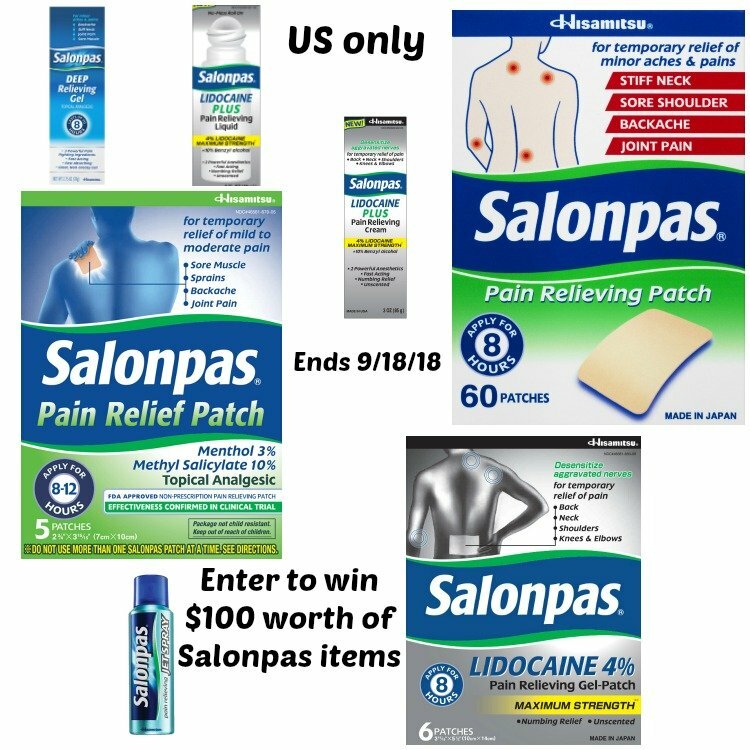 Thanks to Salonpas, I received free samples of the products you can win. Even if you’re not the winner, you can get a FREE 2-patch sample here. This Pain Relieving Cream provides temporary relief of pain associated with back, neck, shoulders, knees, and elbows with a combination of Benzyl Alcohol and Maximum Strength Lidocaine. Benzyl Alcohol is fast acting, while Lidocaine is long lasting. That’s two powerful medicines that provide targeted relief. This contains the same ingredients as the cream, but it is in a liquid form. It provides safer pain relief in a no-mess liquid roll-on. Apply these patches for up to 8 hours for numbing relief. They desensitize aggravated nerves. These comfortable, effective topical pain patches have 3 powerful pain fighters that work at the site of pain. Whether for your back, shoulders, neck or legs, Salonpas Pain Relieving Patch can provide hours of relief. With rounded corners and flexible fabric, application is easy and the patches bend with your movements. The patches stay where you need them and are easy to remove. This Gel contains three active ingredients, camphor (3.1%), menthol (10%), and methyl salicylate (15%), that penetrate deep, providing effective relief for up to 8 hours. It’s an easy-to-use topical analgesic, in a clear, non-greasy gel that starts working on contact. Salonpas DEEP Relieving Gel melts fast, absorbs quick, and rushes powerful medicine deep into muscles and joints. The safer Pain Relief Patch is the only OTC pain reliever labeled to relieve mild to tougher, moderate pain. This provides effective pain relief for up to 12 hours, and it contains two powerful pain fighting ingredients, menthol and methyl salicylate (a NSAID – a nonsteroidal anti-inflammatory drug). Try these Pain Relieving Gel-Patch HOT which contains two powerful pain fighting ingredients. Menthol for a cooling, soothing sensation and Capsaicin for long lasting heat sensation relief. The combination provides up to eight hours of targeted relief! The advanced gel patch technology stays in place better than most other patches. The rounded corners prevent peeling and the split film in the center allows for easy application. This is my favorite product! Salonpas JET SPRAY® provides cool, fast relief of muscle and joint pain. The convenient spray is unique in offering you two powerful pain fighting ingredients to allow you to reach hard to reach areas of the body! Menthol provides faster onset of relief with a cooling, soothing sensation, while the methyl salicylate, and NSAID controls pain for long lasting relief (up to 8 hours of targeted relief)! Finally a pain relieving spray that is no mess with it’s non-drip, quick drying formula! Just point and shoot on still joints such as arms, hands, legs, and feet. This giveaway has ended. Stop by my other giveaways and enter to win them!